This is the first post actually written from Doha. I arrived at 5pm local time which is currently two hours ahead of the UK. Getting through immigration was quick and easy and my bags were on the carousel when I got through. I was met by a driver in the arrival hall which always make me feel important. I recorded a short video of the 4 minute journey from the airport to the hotel. I have, quite sensibly, tried to find out as much as I can about the country I will be living in for the forseeable future. Sifting through the vast array of information from blogs, forums and news websites has provided hours of fruitless reading as well as a few online gems which give a real insight into life in Qatar and the things we need to be aware of. I know that Qatari drivers do not have a great reputation for road safety, so that defensive driving in an essential skill.I know that Qatari bureaucracy means that official business can be lengthy. I know the weather will be very hot in the summer. I have learned a litttle about customs and appropriate behaviour. What has been evident is the amount of information on websites which is well passed its sell-by date. Cost of living information, for example, has proved of little value as Google searches most often point to forum posts from several of more years ago. Owners of these sites really need to start housekeeping to remove the out-of-date content or their websites will begin to lose their value. Over the last seven months I have been reading ‘the Peninsular’, one of Qatars’ English Language Newspapers. It’s a free pdf download which is everyday breakfast reading on my iPad. It’s been a very easy way to get a feel of the country, its political and social attitudes. It’s not just what’s happening but more the way it is being reported. I leave for Doha in two days… it will be interesting to see how many of my perceptions are accurate, but it’s more exciting to think of all the new things I am about to experience. Yesterday was my final day working for Hampshire County Council. We also heard from our estate agent that the house has now been rented. The last few items of our furniture were sold and collected. Over the 25 years with HCC I have created museum exhibitions and displays and built and managed thousands of web pages. Much of the visible museum stuff is now gone… a whole museum in Gosport moved and redeveloped leaving virtually nothing with my signature against it. Like the ghost marks left by the missing furniture in our soon to be vacated house, I guess it won’t be long before much of the web content I created begins to be overwritten or reaches its sell-by date and gets deleted…- my digital mark on HCC will gradually be eroded and then disappear forever.. I received an email the day before yesterday evening confirming my flight to Doha on the 31 August along with a my visa and hotel accommodation information. Unfortunately the visa has my old passport number on it, not the number on my shiny new biometric one… a moment of panic followed by a swift email to the HR dept. 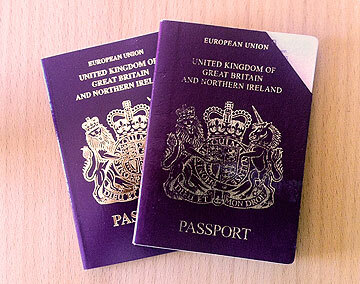 They’d originally told me that a new passport made no difference, but it did. Second problem is that Ramadan just ended and Eid started today… all public institutions remain closed until the 27 August which is only four days before I depart. Emails came back from HR who thankfully must regularly check their inbox even when they’re not at work. If I take my cancelled passport as well as my new one, they think the visa will be valid. If not I will have to enter on a standard visitors visa. The next problem was locating the old passport. I’d packed a whole load of stuff away in boxes, taped up ready for long-term storage while we are away… so boxes had to unsealed… I found the passport in the second box at the second time of searching. And just where is Qatar? Qatar is a small state in the Gulf… so in case you don’t know exactly where it is. The map pin shows where the Museum of Islamic Art is located in Doha… that’s where I will be working… zoom out to see where Qatar is in the world. Our house rental particulars include the statement that we don’t want smokers or pets living in our house when we rent it out. I expect I am going to get a good deal of support for the smoking ban even from smokers, but I guess animal lovers are less likely to agree with the ‘no pets’ requirement. As we have had fewer enquiries than I anticipated, I slightly relented when the agent said that a middle aged couple with a dog were very interested. To get a quick let I agreed for them to view the house… They were nice and they loved the house… they said they’d replace all carpeting downstairs at the end of their tenancy… but then I asked about the dog. I was hoping for a tiny Jack Russell or a poncy King Charles spaniel, but certainly something small… but they had a Rottweiler. It’s interesting how defensive people are of their pets, even when they come from a breed with a reputation for gratuitious aggression. 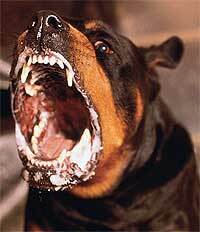 Even the name Rottweiler is scary… so we said no to them. We’re working on the basis that we’d only let to someone we wouldn’t object to as neighbours… so still looking for a non-smoking petless tenant.